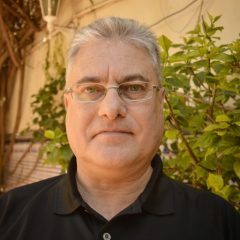 Author gibstevePosted on 17th March 2019 Leave a comment on Are jurors well served? Ahead of the Oscars ceremony last month Keira Kneightley asked a pertinent question: “how do you really judge any of it?” Interviewed in The Times, the twice-nominated actress suggested that unless all the players play exactly the same role in exactly the same film, and each director makes exactly the same script, it’s impossible to decide. All you can say, she concluded, is that you like one film better than the other. While Ms Kneightley was referring mainly to the acting and directing awards the same surely applies to other categories. Take the most prestigious award of all, Best Picture. How, for instance, do you choose between an all-action superhero flick, a tear-jerking drama and a musical biography (viz. this year: Black Panther, Green Book and Bohemian Rhapsody)? “2001: A Space Odyssey”. 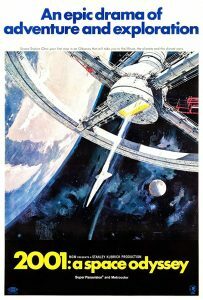 Despite regularly being voted the best science fiction film of all time by critics and audiences and its description in Wikipedia as one of the greatest and most influential films ever made, Stanley Kubrick’s 1968 masterpiece wasn’t even nominated. Kubrick himself got a nod in the Best Director category, but the sole statuette “2001” took home was for Special Visual Effects. “Taxi Driver”. 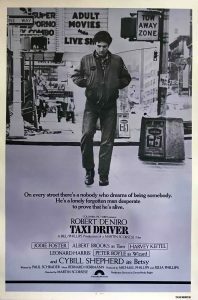 As part of his preparation for the starring role in Martin Scorsese’s 1976 psychological thriller, Robert De Niro lost 35 pounds, obtained a taxi driver’s licence, and when on break would pick up a taxi and drive around New York. The film introduced the world to a 12-year-old Jodie Foster and gave us “You Talkin’ to Me?”, one of cinema’s most quotable quotes. It topped a Time Out poll of the 100 greatest movies set in New York City and was selected for preservation in the US’s National Film Registry in 1994, twelve years before that year’s best picture winner, “Rocky”. “The Shining”. 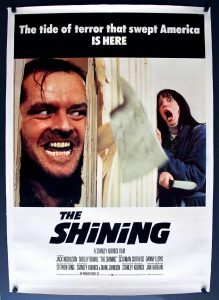 OK so Kubrick is my favourite director and this is the second of his films featured here, but can anyone reasonably argue that this classic 1980 horror film, set in the Overlook Hotel, wasn’t unforgivably overlooked by the Academy? It wasn’t nominated for a single award, not even for Jack Nicholson’s spellbinding performance as Jack Torrance, the unhinged author who accepts a temporary position as the off-season caretaker of the aforementioned establishment. To add insult to injury Kubrick and Shelley Duvall, who plays Torrance’s scared-witless wife, were nominated for the mock Razzie Awards that recognise the worst in film. And they didn’t even win that. 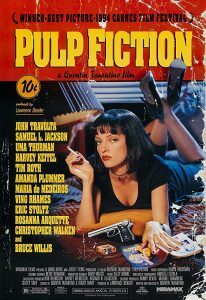 Forrest Gump was 1994’s worthy winner but my choice would have been director Quentin Tarantino’s follow up to the also critically acclaimed Reservoir Dogs: Pulp Fiction. The review-aggregation website Rotten Tomatoes describes it as “outrageously violent, time twisting, and in love with language … widely considered the most influential American movie of the 1990s”. It received seven nominations but only took the Oscar for Best Original Screenplay. 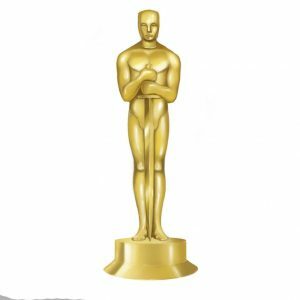 Other classic films to miss out on the top award include Citizen Kane, The Wizard of Oz, The Graduate, Apocalypse Now and Raging Bull. Here’s a few films that are less well known: Don’t Look Now, Paths of Glory, Synecdoche New York, Donnie Darko, Zodiac. What do they all have in common? They’re great – and they didn’t get a single Academy Award nomination between them. 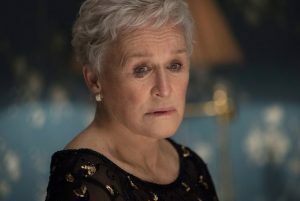 As for this year’s awards, I was pleased to see the unfancied Green Book take Best Picture, but disappointed that seven-times nominee Glenn Close is still waiting for a first Best Actress statuette despite her movingly impeccable performance as an unacknowledged author in “The Wife”. Nearly a year ago in this column I was fretting about the latest project to go before the Development and Planning Commission. How silly of me. The proposed multi-purpose building at Devil’s Tongue was to have a mere 15 floors. Positively dwarfed by what’s planned at Hassan Centenary Terraces. 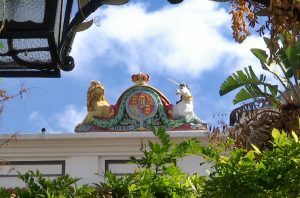 “Standing tall on the east side of Gibraltar”, boasts the website. Not half. 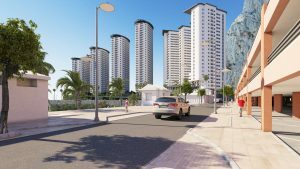 The six towers that between them will contain 665 flats will be of up to 35 storeys and rise to 110 metres. That’s more than double the height of the Tower Blocks in Glacis. I know we need affordable housing: the high level of interest from prospective purchasers proves it. But must they be packed in like sardines? Three of Gibraltar’s most highly regarded NGOs are so worried that they took the unusual step of issuing a joint statement to outline their concerns. The Ornithological and Natural History Society, the Heritage Trust and the Environmental Safety Group complained that: “such tall buildings will create a precedent for the remaining, major plot awaiting development on the east side, creating a kind of Benidorm effect”. “The impact on beach users”, they added, “has not been assessed adequately”. And “the scale of these buildings, so close to the north face of the Rock and to the beach, will have a negative visual impact on our iconic landscape”. What’s interesting is that these three organisations are all represented on the DPC. Given their strong objections, logic dictates that they would have voted against the scheme had they had an opportunity to do so. But as they point out: “Government projects are still not subjected to a vote. Thus, this project is presented (to the DPC) for comment, but not permission”. Only when the new Town Planning Act is adopted will the government require the Commission’s approval before carrying out any development. The Act was passed and published in the Gazette last August, fully six months ago, but has still not come into effect. When will it? I asked. “When all necessary administrative and technical requirements are in place”, came the reply from Number Six Convent Place. Which could be tomorrow, next year or never. Let’s see how many more Hassan Centenary Terraces are sanctioned before government projects are finally reined in. 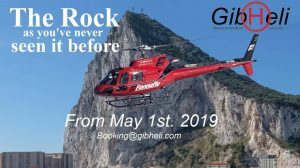 Credit to Fonnafly, the Norwegian company due to start helicopter tours around Gibraltar in May. When I wrote this article for the Gibraltar Chronicle I berated them for describing the Rock on their website as “a crown colony since 1830”. Happily this has been rectified and Gibraltar is now correctly referred to as a British Overseas Territory. Well done chaps! 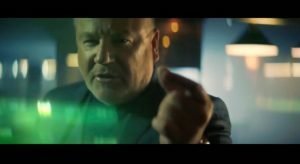 Author gibstevePosted on 26th February 2019 Leave a comment on Another Benidorm? 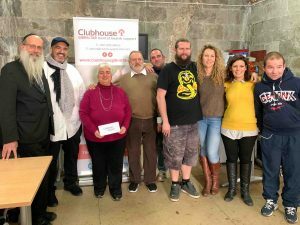 I declare an interest: I’ve just joined the board of trustees of Clubhouse Gibraltar. My only interest, mind, and it’s shared I’m sure by the other trustees, staff and members, is that this selfless organisation continues to flourish, as it provides ever-growing support to members of our community with mental health issues. The next target is new premises. After operating for a couple of years from Toc H, where the dampness was affecting people’s health, Clubhouse were allocated “temporary” premises in Wellington Front in September 2013. It was supposed to be for one year only, to free them from what CEO Emily Adamberry Olivero describes as the “terrible conditions” they were working under, but five years on they’re still there. Plans to accommodate them in Rosia Road never materialised despite the keys to the intended premises having been handed over by the government and the Clubhouse logo being prominently displayed at the site. This time though, it seems the move is actually going to happen. At the end of 2016 Clubhouse were told their permanent home would be at 304a Main Street, where the Gladys Perez centre is now, a stone’s throw from the residence of their recently appointed patron, Governor of Gibraltar Ed Davis. The Development and Planning Commission approved the plans, and GJBS is poised to carry out the necessary works. As far as the charity is concerned, the sooner it happens the better: with 160 current members Clubhouse badly needs more space. While the government has said it will meet the construction costs, extra funds are needed for things like furniture and equipment and to expand the services offered. The new premises will have a working kitchen and cafeteria, for instance. One local entrepreneur has already dug deep into his pockets. 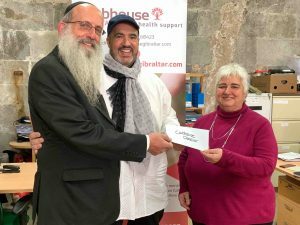 Jimmy Attias has handed Clubhouse a cheque for £30,000 – the largest single private donation the charity has ever received. (Mr Attias has also generously donated £30,000 to Gibsams). At the presentation he urged others to follow his lead; the business community will soon have an opportunity to do so. Clubhouse are organising a fund raising Gala Dinner at the Sunborn Hotel in June, and will be asking companies to support the event, which will include an auction and a guest speaker. After agreeing to become a trustee I was given an initial briefing by Emily and her team. I was bowled over by their dedication, and everything they do. Did you know that besides preparing and training members to get a job through their work-ordered day programme, they also provide after-hours support for carers and people who want to talk about depression and anxiety? Organise outings both locally and across the border? Produce a monthly, members-only newsletter? Run mental health first aid courses? They even have a reach-out programme to visit people at home, in prison or in hospital. In a testimonial video on their website the Governor describes Clubhouse Gibraltar as a “compelling and inspiring example of the inclusive and mutually-supporting Gibraltarian community that goes out of its way every day to look after people in need”. I wholeheartedly agree. It provides an invaluable service, worthy of everyone’s support. There we have it. Spain wants to put the clock back and get the world at large, or at least the European Union, to start calling Gibraltar a colony again. It would be easy to dismiss as sour grapes Madrid’s latest move, which would see a proposed EU law on visa-free travel classify Gibraltar as “a colony of the British Crown”: an act of petulance by Pedro Sánchez after he failed to secure a clause in the Brexit withdrawal agreement that would have enabled him to veto the application of any future UK/EU trade agreement to Gibraltar. But there’s probably more to it than that. According to reports, the Spanish government would expect the “colony” epithet to be used in all EU legislation regarding the UK after Brexit. So what, you might say? Sticks and stones and all that. But our chief minister immediately identified a potential long-term danger: if people think of Gibraltar as a colony they’ll be more likely to concur with Spain that the Rock should be decolonised in accordance with the principle of territorial integrity rather than going down the route of respecting the right to self-determination of its inhabitants. I find it ironic though not surprising that even as Spain continues to do all it can to further its sovereignty ambitions, Gibraltar is expected to act as a good neighbour and co-operate. Witness the withdrawal agreement’s Gibraltar protocol and its associated memoranda of understanding. 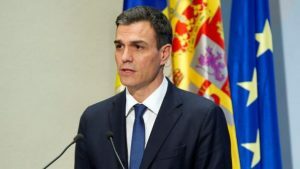 These documents would oblige our government, among other things, to reduce the retail price of tobacco products, which would be linked with the price of equivalent products in Spain, and adopt a tax system aimed at “preventing fraudulent activities”, not just in respect of tobacco but alcohol and petrol as well. Gibraltar would be required to “achieve full transparency in tax matters”, therefore implicitly acknowledging some degree of opacity. And a committee with Madrid central government representation would be appointed to assess the environmental impact of things like (surprise, surprise) land reclamation and bunkering. It would also discuss “fishing activities”. As I was writing this column I stumbled upon a Financial Times article from last September. It suggested that whereas it was envisaged that the withdrawal agreement would contain protocols on Northern Ireland and Cyprus there were no plans for one on Gibraltar. That idea was mooted by the Spanish government and went “beyond the original plans of EU negotiators”. Small wonder that Spain is now anxious that the protocol and memoranda should survive a withdrawal agreement rejection, with foreign minister Josep Borrell claiming that even if Britain leaves the EU without a deal, agreements over Gibraltar would remain in place. Fabian Picardo has rejected this view insisting that without a withdrawal agreement the MoUs are not legally effective, but in these uncertain times no one can say for certain what would happen. What’s more, if the EU agrees to reopen negotiations on the Irish backstop Madrid may well demand that it do likewise over Gibraltar. I remain convinced that the best outcome for us is that MPs stick to their guns and reject Theresa May’s deal each time she submits it to a vote in the Commons. That way we may end up with a second referendum and a vote to remain in the EU, which would render the Gibraltar protocol and everything else academic. Were you surprised that the UK voted to leave the European Union in the Brexit referendum? 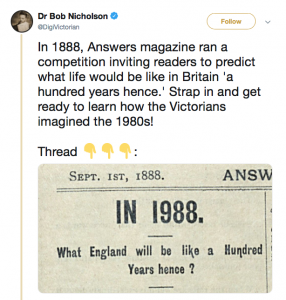 You really shouldn’t have been: it was anticipated a whopping 130 years ago! “England will by her very policy of national aggrandisement slowly sink into the condition of a second-rate power (somewhat like Sweden of the present day), and her fall will in the end be accelerated by those whom she has in former years befriended. In the year 1988 she will hold no weight in the Councils of Europe”. It didn’t win, and the prediction is out by some three decades, but the entry would surely have been among the front-runners if the magazine could only have known how eerily prescient it was. Many of the ideas floated were fanciful and never came to pass. “Ships, houses, railway lines and carriages are made of … unbreakable, indestructible paper”, for instance. Or, a “Continuous railway from London to Pekin though Siberia”. But others were surprisingly accurate. “Electricity will take the place of gas and coal in dwellings”, wrote one. (Thomas Edison’s light bulb had been around less than ten years). While another predicted that “Armies shall meet in the air”. (They did in 1914 with the outbreak of the Great War). My favourite was the suggestion that “invasion is made impossible by the intellectual, self-acting pyro-aqua vengeance bombs”. I’m not sure what the author was on, but laudanum (a mixture of alcohol and opium) was extremely popular in Victorian England. I wonder: might our editor be inspired to emulate Answers magazine and invite Chronicle readers to share their vision of the Rock in 100 years’ time? Our political status is settled. Following the secession of Catalonia, the return of Ceuta and Melilla to Morocco and the creation of an independent Basque nation, Spain lost the appetite to continue to press its sovereignty claim and agreed to recognise Gibraltar’s decolonisation through the principle of self-determination. We’ve been removed from the list of non-self-governing territories of the United Nations but it means little in practice, since that ineffectual organisation collapsed soon afterwards. In contrast with the UN the European Union is going from strength to strength, bolstered by the UK’s decision to stay in after all and its enlargement to 40 members. Gibraltar benefitted greatly from continuing EU membership. Our finance centre ranks among the top five in the world and income from tourism is at an all-time high, thanks in no small measure to the decision of leading cruise companies to choose Gibraltar as their home port for Mediterranean cruises. A new era of rapprochement has seen the dismantling of the Gibraltar-La Línea frontier and relations with our nearest neighbour are vastly improved. 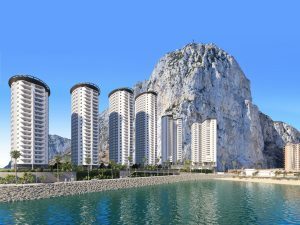 Forty thousand Campo residents earn their living in Gibraltar and many local businesses have expanded across the border. Spanish is again being widely spoken by Gibraltarians, who increasingly shunned it during the years that Madrid’s claim to our land endured. One blot on the horizon, or several to be more accurate, is the proliferation of cheap, 3D-printed high-rise buildings to create office space and accommodation for an ever-increasing workforce and resident population. But on the plus side the advent of the flying car has eliminated the Rock’s critical traffic, parking and congestion problem. Not to mention the need for cycle lanes. A family custom we fastidiously observed when I was still living at home with my parents and siblings was to listen to the local lunchtime news on Radio Gibraltar. Much as Brexit now worries us, in the late 1970s we were concerned about what the future held for the Rock in the uncertain post-Franco era. Initial optimism that the death of the Spanish dictator in 1975 would lead to improved relations and a swift reopening of the border soon subsided. The Strasbourg process that began in 1977 resulted in little more than the restoration of telephone links, and it gradually began to dawn on us that newly democratic Spain might seek to exact a sovereignty price for reopening the frontier gate. It was against this background that Foreign Office minister Sir Ian Gilmour was despatched to Gibraltar in July 1979 to put across directly to the Gibraltarians the views of the recently elected Conservative government of Margaret Thatcher. Many drew comfort from his comment that Her Majesty’s Government considered the continuing Spanish restrictions to be “unjustifiable”. But it was another word he used, as reported by GBC in that 1.30pm radio news bulletin, that sat ill with me: the minister said it was “inconceivable” that the frontier should remain closed in an enlarged European Economic Community. Spain had already applied to join the EEC and the UK had said it would fully support the application, irrespective of the Gibraltar dispute. Therefore, Sir Ian’s apparent linking of European Community membership with the lifting of restrictions did not go down well in Madrid. But what stuck in my mind was that word “inconceivable”. If you really mean “impossible” why not say so? After all, what’s inconceivable today may be quite feasible tomorrow. Just ask Theresa May. The frontier of course did eventually reopen, but not for another five and a half years. What evoked this memory was the announcement by Jyske Bank that it intends to sell its Gibraltar subsidiary. 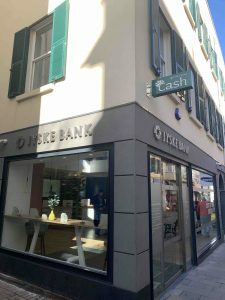 There are no longer, the bank said, “any crucial synergies between the operations in Denmark and Gibraltar … (nor) the same strategic match between the subsidiary bank and the Group”. But another factor was the risk posed by Brexit. Gibraltar, Jyske’s statement added, “will follow Britain out of the European Union and may be subject to legislation different from the rest of the Jyske Bank Group”. Yet, shortly before the European Union referendum, the bank was upbeat about the future of its local operation regardless of the outcome of the referendum. In an interview with me in March 2016, CEO Christian Bjørløw said Jyske had diversified over the years and was well placed to survive a Brexit. “I’m not afraid for our operation at all” he asserted, before concluding that the local subsidiary was “as solid as the Rock”. There’s “inconceivable” for you. By the way, the interview is still available on YouTube. It’s been rather an inauspicious start to the year hasn’t it? Major trade union discontent on the issue of agency workers. Government warnings that, in the event of a no deal Brexit, Gibraltar European health insurance cards will cease to be valid throughout the EU, the use of Gibraltar ID cards for EU travel purposes may no longer be allowed and surcharge-free mobile roaming would no longer be guaranteed. The withdrawal of Sky Television’s channels. Tragically, the discontinuation after existing stocks have run dry of Gibraltar’s very own ‘Brand 5’ lemonade. Here’s hoping that, as per the title of D:Ream’s smash hit (Labour’s 1997 election campaign song, incidentally): Things Can Only Get Better. Memories fade with time, but few of us who lived it will easily forget the impact that the arrival of satellite television had in Gibraltar. Right up until the early 1980s our viewing options were limited to GBC, a handful of Spanish terrestrial channels and Moroccan TV if you were lucky. Then along came MTV, and suddenly everyone wanted to watch music videos. Unsightly satellite dishes sprouted from rooftops until the entrepreneurial masterminds of today’s communal systems took over and removed many of them. The likes of Sky News and CNN transformed the way we consumed news with their 24-hour rolling coverage. A veritable smorgasbord of specialist channels blossomed catering for pretty much all tastes: “adult” films to cartoons, TV shopping to documentaries, movies to sitcoms. Arguably the real game changer, though, was Sky Sports. It introduced me, and I imagine many others, to the delights of test cricket and more arcane sports like rugby league. Boxing, as well as the golf and tennis majors could now be enjoyed on a regular basis. Most significantly, Sky brought live UK club football for the first time ever into our living rooms. In the past, English footie on the box was restricted to the FA Cup Final and recorded highlights of the previous weekend’s top-flight matches. That changed dramatically when Sky Sports was awarded the exclusive rights to broadcast up to 60 live Premier League matches a year from the 1992/93 season. It seemed too good to be true. And that’s precisely what my GBC management colleagues and I were told it was by a visiting Sky executive not long after I was appointed news editor in 1996. As GBC sought to adapt to the brave new world of satellite TV one avenue we explored was the possibility of simulcasting the programmes of UK channels such as Sky News during certain hours of the day. That didn’t prosper and we were further warned that Sky would soon pull the plug on the broadcasting of its sports, films and entertainment channels by local operators who were not paying for the full rights to do so. Given that this conversation took place more than 20 years ago, the only surprise for me about losing Sky’s channels – with those of other providers likely to go the same way – is that it’s taken so long; I guess Gibraltar’s small size made us not worth bothering about. But that was always going to change once an entity seeking to offer a properly licensed service objected to competitors who made hundreds of channels available to their customers for a relative pittance. I’m as unhappy as the next person at the prospect of seeing my viewing choices drastically reduced, but I’m also realistic enough to acknowledge that as a community we’ve had it too good for too long. My hope now is that a way will be found to enable us to continue to receive the most popular channels, even if it means paying more for them. Maybe, in this election year, the government will ride to the rescue? The Metropolitan Police was the unlikely harbinger of Christmas cheer when it made public a selection of the funniest “emergency” calls it received in the year to 30 November. Among the genuine 999 calls were a man in a stew because it was taking too long for his lunch to be served at a London pub and a woman who complained that her bus driver had been whistling throughout her journey. “What if everybody starts whistling or singing in the bus?” she fretted. Meanwhile, someone rang simply to say Happy New Year, while a prankster claimed that KFC had run out of chicken. He quickly hung up though when they told him they could see from where he was phoning. The officer in charge of the Force’s call handling wasn’t amused. Chief Superintendent David Jackson pointed out that nuisance calls take away police resources at a time that police numbers and funding are stretched. The Met received more than two million emergency calls in the first eleven months of 2018 of which nearly 22,000 were time-wasting calls. “Imagine if one of your friends or loved ones was in need of the police as quickly as possible and it turned out we could not help because we were having to deal with one of these hoax calls – I’m sure that you, like us, would be devastated and extremely annoyed”, Mr Jackson sniffed. It’s a problem that afflicts the Royal Gibraltar Police too. 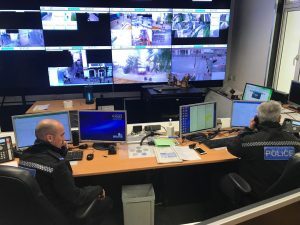 Between October 2017 and March 2018 the RGP’s control room received more than three thousand supposedly urgent calls, but only one in six was deemed to be an emergency requiring an immediate response. Complaints about the noise of the fair – not ours: La Línea’s! A resident who expected the boys in blue to remove a baby seagull from their balcony. Ditto, demanding assistance because their boiler had burst. Moans about a cockerel’s persistent crowing. Requests for help because the housing estate’s communal satellite TV system had broken down. Not to mention people dialling 199 just to ask the time or whether it’s raining. Like his UK counterparts, Commissioner Ian McGrail will be hoping for far fewer dud calls in 2019. A year ago in this column I set out some of my wishes for 2018. Happily a couple of them came true: government projects cannot now go ahead without the approval of the Development and Planning Commission, a 2011 GSLP/Liberals election manifesto commitment finally honoured following the introduction of the Town Planning Act in August. And the parking situation at the parcel post office has greatly improved with the facility’s move from the North Mole to Europort. Still no delivery, though, on another 2011 pledge: a sewage treatment plant. A contract for one was “placed” in October 2014 and last January an Advanced Works Contract was awarded. I asked the government about the delay in getting this project off the ground and was told that construction is expected to begin when the Environmental Impact Assessment is completed and contractual negotiations have been finalised. While these are “currently programmed” during the first quarter of 2019, we could probably do worse than hold our nose, rather than our breath.